Next Monday night, Last Comic Standing is finally coming back to TV and this season promises to be a funny one. The Office 's Craig Robinson will be the new host and Greg Giraldo, Natasha Leggero, and Andy Kindler will sit at the judges table. 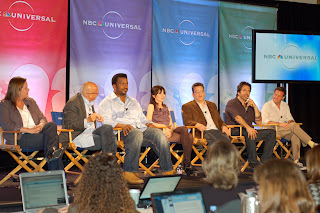 We sat in on a panel featuring these stars as well as Executive Producers Page Hurwitz, Peter Engel, and Jayson Dinsmore. Here's what they had to say about female comics, changes this season, and comedic influences. Q: What's the addition of Craig been like for the season as far as the energy and the atmosphere for the rest of you who have been on the show longer? PETER: It's great. I mean, we have funny people, and it's all about funny. Craig is one of the hottest young, actor-comedians going. The judges are all qualified and huge comedy stars in their own right, and it's just a whole new feeling of bringing it up to a different level where it's all about the funny. Q: Certain comics come on the scene, and they're electric. They just capture your imagination. Is there anyone like that that we can look forward to on this coming season? GREG: There are lot of really, really funny people. There's tons of great comics. I don't know that there's somebody.. one person that's going to explode. There are really funny people. In fact, if anything, the problem is we had to eliminate people that were great. The show as a stand-up comedy show will play fantastic. I don't think anyone has seen as good a comedy showcase on TV in a very long time. Q: Still more men to women? NATASHA: Women are just starting to get into every field now. So we're catching up in comedy. ANDY: We made the women fill out an extensive form. GREG: I think it's nice that they let the girls do it and everything. ANDY: I like a funny lady. GREG: Just numbers-wise - numbers-wise, there do tend to be more male comics. There's actually a lot of very funny women comics on the show. Q: What cities did you go to? PETER: We only went to two cities this year. We used to go nine, ten. Sometimes we went around the world, and essentially we came to the conclusion with such great panelists and such great judges, why not just go for the best comics. Essentially, the best comics are in New York and L.A. They came all over there. So they came from all over the country, and usually you pick ten in New York for the semifinals. Then you have to go to four more cities, you have to leave spots open, but the truth of the matter is 11, 12 through 16 should probably have come out of New York. So we've had a much higher caliber of comedy this year. Q: From any of the judges, it's been New York and L.A. Are women funnier in New York or L.A.? ANDY: Actually, I think women are funnier in L.A. because it's colder in New York and you know how ladies are with the cold. There's no difference. There's no geographic differences anymore in comedy. PETER: Cleveland was actually funnier. NATASHA: I think the comics in general in New York... They get more stage time. So they actually are more polished, and sometimes the bad people are better in New York. ANDY: Even the bad comedians are hilarious. NATASHA: Because comics in New York, they do like four spots a night sometimes. So it was a little more challenging to find out who was really funny and who was just like polished. Q: Is there going to be a shift in how the elimination or audition process is? PETER: We did four hours of search or auditions. Then we do four hours of the semifinalists. Then we get down to ten. Then we're going to go from ten to eight to six to four to a winner. PAGE: You'll also see in the audition processes over the four hours that I think we're going to be telling more stories. So you will get to know more people, and we're looking at more quality rather than quantity. Q: Compared to previous seasons, are there other changes in terms of the format? PETER: Well, there's no house and no challenges… It's all competition. ANDY: You're going to need a spreadsheet to figure out the final judging. That's how confusing it is. Spreadsheet is a hilarious word, people. Pick it up. Q: Who is involved in the screening process because presumably the really boring people, the American public is spared from? NATASHA: We were not spared from them. We had crazy people. We had boring people. We had naked people. ANDY: We had naked, boring people, which is very hard. PETER: We had naked, funny people. GREG: Dangerous people. Violent people. PETER: We had a guy who taped himself to the stage. PAGE: We definitely have open-call auditions, and as many people as we can see and get before the judges will go before them. Q: Craig, the show has had a number of hosts over the years, and they've all had slightly different interpretations of what their role as host was. So what is yours going to be? CRAIG: I -- I -- I do not know what I'm doing here. I don't know why they wanted to get the show re-canceled. So… That's kind of my take. I just come out and just do Craig. There's no pre-thought going into it, just going out and having fun. Everybody is real supportive. JAYSON: I'll tell you what, the energy he brings is very different than what you would normally see in a traditional host. He's not just a traffic cop. He brings that smarter sensibility that you see in The Office and Hot Tub Time Machine and now Shrek 4 . Any other ones you wanted me to mention? NATASHA: Craig is also very musical. I don't know if you know that, but he has a band that he tours with. JAYSON: There's one other thing I would say that we have this season that we haven't had in the past which is judges that are funny. Like, that whole element, that whole feeling hasn't really been a part of the show in the past. And a lot of the comedy comes from these three guys right here just going back and forth. ANDY: We are laugh-out-loud funny. PETER: We haven't found them yet. CRAIG: I have no strengths. PAGE: But incorporating his musical comedy is such a great bonus for us. That's something we haven't been able to do in the past, and he's just such a pro, and he really is like the best at that. So you'll see a lot of different things from Craig that he brings to show, and it's really great. Q: Craig, could you talk about your comic influences? CRAIG: My influences -- I have a wide range from Cosby to Pryor to Martin Mull and Steve Martin and Steven Wright… and one of my favorites is Sam Kinison. So, yeah, these people, I would watch and just kind of enjoy -- and Paul Mooney. And I think I'm a mixture of all of them. If you mixed it down and made it very dull, and then that's the style I wanted to bring to the show. And I do it from behind like a keyboard usually, and they're making me stand up. So that's -- hello. Q: And for the judges, if you were influenced by a particular comic, wouldn't you be looking over the audition process for a comic of that ilk? So if you were influenced by Drew Carey, would you be looking for another Drew? NATASHA (gesturing towards Andy): You nailed him. ANDY: Right through my soul. He got that Price is Right job, and I am bitter about it. I know how much a thing of ketchup is. No… When you watch a comedian, you shouldn't bring preconceived ideas to a comedian. The only way to really watch and then understand a comic is to not try to attach to them something you want them to be. I think that's the only way to watch comedy is to let go of what you know before you watch them. I wasn't funny there because I felt that was a very serious question, but I was influenced by Totie Fields, not so much her on-stage work, but more her short stories. And I like Ally Sheedy's poetry, but that's just me. GREG: My biggest comedic influence by far was Mexican funny man Cantinflas. So, unlike Andy, I do try to find someone that might mirror Cantinflas. It wasn't really that easy because the facial hairstyles have changed . And… we have some great Mexican-American comics in the competition, but they also have veered away from the Cantinflas style… I personally didn't look for anybody that mirrored people… In fact, I was influenced more by the comics that were bad when I started. When I looked at great comedians, I thought I could never be one of those guys, but I would see the guys in those really bad shows -- Stand-up Spotlight and all those. I would think, now if those guys are on TV, I could certainly do that. Q: Nothing could be more difficult than to stand up in front of a bunch of people and dare them to laugh. So why do you do it? What do you get out of the experience? NATASHA: You clearly did not have a bad childhood. ANDY: If you thought about how scary it was… when I went out on my own, I literally came back from a show and sobbed once uncontrollably. So, it's a horrible thing when you first start, but you can't focus on that. You've just got to focus on that you want to do the comedy part and not think about how embarrassing and shame-based it is. CRAIG: In my case, I felt like comedy chose me. It was an uncontrollable thing inside me. I just kept playing and kept being silly, and my father to his detriment said to me one day, "You so silly. You know people get paid to be that silly." I was like, "Oh really?" So like Greg was saying about watching these MTV half-hour comedy hours. At that time I didn't realize that what they would do is just show two minutes of somebody's act, and they might be talking about whatever, being in the kitchen or whatever the act was about, but once I started doing comedy, I didn't realize that those two minutes might have been just them messing around for two minutes, but because I watched those two minutes, I felt like I could do that. I know I could be as funny as that, at least. And I was led down this road. GREG: But people always talk about the bravery that it takes. How do you have the courage? As if it's like being a daredevil or something. It's not just having the guts. The guts part comes pretty easily. It's the getting good at doing the craft of comedy, which is what we're looking for on the show. We're not looking for the funniest person in America. You know, some people are really funny just because they're crazy or whatever, but we're looking for the funniest comedian, which is a craft that some people have to hone. We're looking for people who are really funny consistently and on purpose.